Thanks in large part to strength in numbers and uniqueness in sound, Revolution Brass Band has carved out quite a name for itself in the local music scene. Both qualities will be on full display this Friday, August 4, during LakewoodAlive’s Front Porch Concert Series. Week 5 brings to the stage Revolution Brass Band, an energetic eight-piece group founded in 2010 in the pubs of Cleveland. Known for its diverse musical repertoire and horn-driven sound, the band embraces a variety of genres when it performs ranging from New Orleans jazz and funk, to soul and R&B. 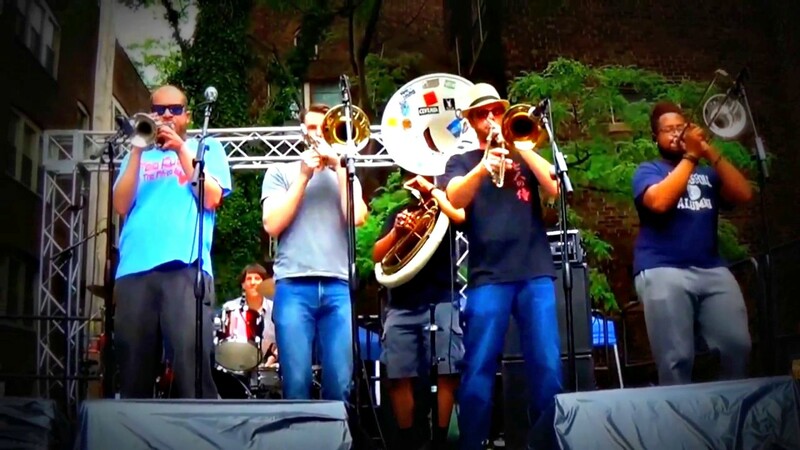 In addition to performing original arrangements, Revolution Brass Band is dedicated to playing compositions from within the band, often resulting in a unique sonic experience for listeners. The band consists of Jacob Wynne (Trumpet), Kris Morron (Trombone), Steve Zombory (Alto Saxophone), Dan Wenninger (Tenor Saxophone), David Kasper (Baritone Saxophone), Cuthbert Johanssen (Sousaphone), Tim Lane (Tubs) and Cap’n Nemo (Washboard).